PlayShapes is an interactive, play-led activity for children that allows them to create their own sculptures, installations or playscapes. Based on 1m coloured cubes that break down into steps, triangles, polygons, rectangular prisms, and cylinders children use their imaginations to create new structures either alone or in groups. At the beginning of each 45 minute session seven cubes are set out in the gallery space in a grid. As play commences the children can break down the cubes and rearrange the shapes into limitless combinations. At the end of the session, parents/carers and children work together to reassemble the coloured cubes ready for the next 45 minute long experience. 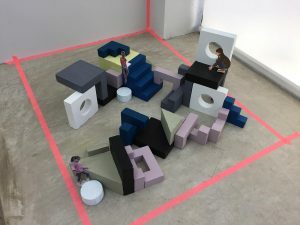 The idea is conceived as a creative antidote to the rigid formats and primary colours of soft play environments I have frequented with my own children. 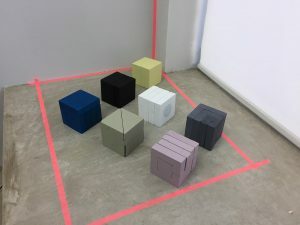 I have also been inspired by the work of Isamu Noguchi and Froebel’s Gifts as a way of introducing young children to experiment with colour and three dimensional space before they are able to comprehend them intellectually.